DAKAR (AP) ― Senegal’s highest court ruled just after midnight on Monday that the West African country’s aging leader was eligible to run for a third term in next month’s election, rejecting appeals filed by the opposition and eliminating the last legal avenue for challenging President Abdoulaye Wade’s candidacy. The court also rejected the appeal of music icon Youssou Ndour, stating that his candidacy was invalidated because he did not file enough valid signatures. The opposition has called on the country’s increasingly disenfranchised population to rise up against Wade, and protests are expected this week. When the constitutional court issued its initial ruling Friday and approved Wade’s third-term bid, angry youths clashed with security forces, stoning a police officer to death. The court’s decision extinguishes any hope that the country’s political crisis will be resolved through legal means, and the opposition’s increasingly strident calls for a popular uprising has many worried that this normally peaceful nation could slide into conflict. Late Saturday before the court’s final decision, Ndour spoke out, encouraging his countrymen to stand up to Wade. He said that the regime was preventing him from running because they were afraid of him. The Grammy-winning singer promised to “make a series of revelations” in coming days, suggesting that he planned to reveal details of alleged government corruption. At the core of the dispute is the issue of how many terms the constitution allows. When the 85-year-old Wade was elected in 2000, the constitution had no term limits. He had it changed in 2001 to impose a two-term maximum. Wade has long argued that he is the author of the new constitution, and so knows it best. He claims that the changes enacted in 2001 are not retroactive, and so his “first” term should be considered as the one that started after the law was passed, meaning in 2007 when he was re-elected. Critics say that the court is a biased institution. All five of the judges were appointed by Wade. Soon after the court’s ruling, Ndour’s campaign manager Alioune Ndiaye told the private radio station RFM, which is owned by the singer: “This decision doesn’t surprise me. It takes the same direction as the decisions taken earlier by the constitutional council. The members of the council take themselves for God ... They have decided that Youssou Ndour will not be a candidate as he is likely to create an (unpleasant) surprise” for the ruling party. Opposition leaders met earlier to say that they are ready to fight to make sure that Wade does not run in the Feb. 26 election. 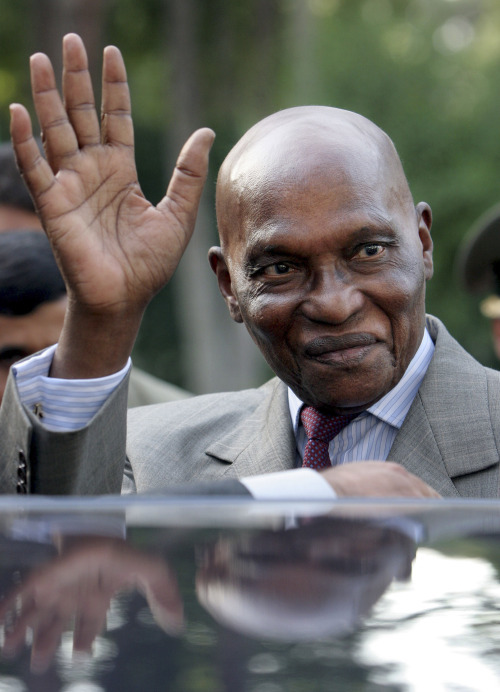 “Abdoulaye Wade and his system want the following: They want to cling to power until the very end. We in the opposition, we should also know what we want,” said Ousmane Tanor Dieng, another opposition candidate who was a leading figure in the Socialist Party that ruled Senegal for 40 years before Wade was elected in 2000. “I call on the people to show their resistance,” he said.